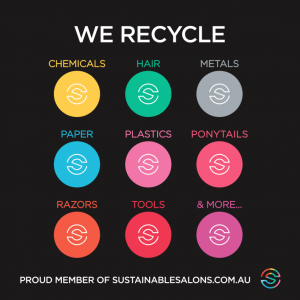 This revolutionary resource recovery program is designed for our salons to aim to achieve zero waste, reduce its carbon footprint, and implement sustainable work practices that benefit the local community. Your ‘cut-off’ hair will support charitable causes such as oil spill clean up projects, local community gardens and charitable wig making services. 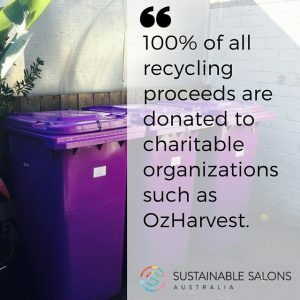 All the proceeds gained from recycling the salon’s metals such as foils, colour tubes, cans, etc will be donated to ‘not for profit’ community based organisations that do a killer job helping humanity every day. Any leftover hair colour will be recycled into new liquids. Once our tools (used to cut & style your hair) reach their end of life, they will be broken down and all valuable parts will be repurposed. 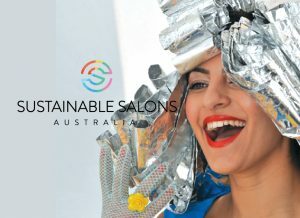 So the next time you visit our Sustainable Salon please feel free to ask your stylist what charitable programs benefit from your cut off hair, used foils and recycled hair tools.